Our tours can provide the perfect social event for your convention’s attendees. Whether you want to show them the city before the convention starts or leave them with a lasting impression as they depart for home, Brush Hill Tours is the right choice. Brush Hill also offers customized tours of the Boston area. Our professional and knowledgeable tour guides will take you through the historic streets of Boston. Visit landmarks such as Faneuil Hall, the Boston Common, Paul Revere’s house and “Old Ironsides” as we give you an insider’s view of Boston. 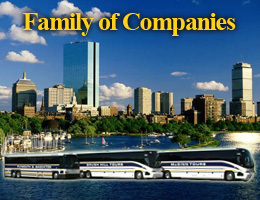 Brush Hill Tours is the local transportation expert in Boston and its surrounding communities. As the preferred choice of travel in the area, allow us to provide transportation services for your attendees to and from the convention center and their hotels. We will accommodate all of your group’s needs and ensure the safety and comfort of each of its members. Request a quote or call our sales staff at 781-986-6100.